3 Bedroom Flat For Sale in Manchester for Price on Application. The Penthouse 360 Building. Total floor area of approximately 4780 Sq. Ft. A labour of love, a vision of creating arguably one of the best living spaces with no expense spared in the city centre. Several architect plans were commissioned with the best one chosen to create an inspired, spacious, and highly comfortable home that's the last word in both luxury & privacy. Not just internally but also harnessing the phenomenal views of The City of Manchester, The Town Hall, Salford, Media City, & Castlefield Basin. Consisting of: key access only lift, lobby / gym area, Grand entrance hallway, WC, Living area measuring close to 50 ft. Bespoke circular kitchen, additional laundry kitchen. The Cheshire room is quiet, peaceful and relaxing with handmade AV furniture. Three luxury bedrooms and double en-suites. The Master having a handmade dressing room. External private terrace and a balcony. Climate control system controlled room-by-room offering both air con & heat with slot diffusers that are flush providing the ideal climate throughout the year. Electric blind spurs are fitted throughout. Highly insulated and sound proofed. A quiet oasis within the city. The lift uses a key to gain access to the Penthouse and opens in the lobby. Double glazed window. Porcelain tiled flooring, painted plaster ceiling, ceiling light and a gym area. Video entry system. A control hub to adjust the climate, lighting and a police connected alarm system by ADT. The climate control is by Daikin and easy to use LCD panel help to you create your ideal climate. Cat 5 cabling throughout with outlets in 6 rooms. Custom built fitted comprising of a double wardrobe providing handy storage on arrival. Climate control, Tedd Todd engineered classic wide oak flooring, painted plaster ceiling, spotlights and ceiling light. Access to the terrace. Total closure light switch with multiple mains points. Created by Porcelanosa with tiled flooring, painted plaster ceiling, ceiling light. Concealed cistern WC. An extraordinary living area measuring nearly 50 ft. Sliding double glazed door, opening onto the terrace. Double aspect double glazed windows facing the rear and side with views. Air conditioning, solid oak flooring, painted plaster ceiling. A bespoke circular kitchen by Earle and Ginger of Didsbury. 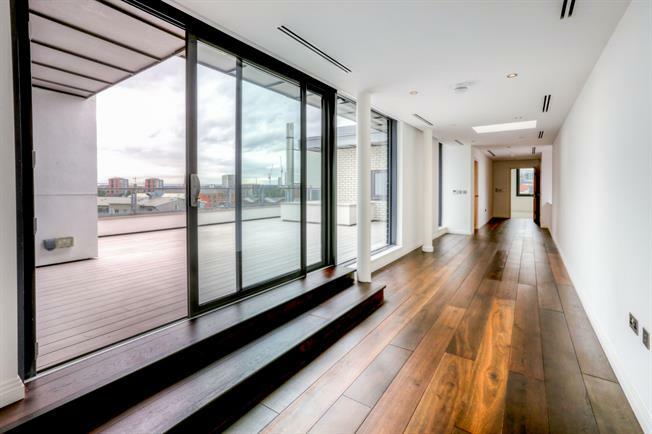 Fitted wall and base units with a circular cooking island, single sink and with mixer tap, integrated, electric oven, integrated, induction hob, overhead retractable extractor, and integrated slim line dishwasher, Amtico flooring offering amazing views over the Castlefield Fort and Basin. Multiple phone, Ethernet and mains points. Bespoke Walnut doors from Spain with Karcher handles. A second fitted kitchen / utility room used for laundry and food storage, painted plaster ceiling, spotlights. Corian work surface, fitted and wall and base units, stainless steel sink and with mixer tap, integrated dishwasher, integrated washer dryer. Amtico flooring. Double glazed window. Climate control, Cormar Sensations carpeted flooring, painted plaster ceiling, spotlights and feature LED lighting with a socket suitable for a chandelier.. Bespoke joinery by Oakleigh Bespoke Cabinet Makers who created this one of a kind piece of furniture to house a widescreen 4K TV. Incorporating a Gasco fire with flame and flame plus heat setting. A bright airy room that is quiet, peaceful and relaxing. Could be also a cinema room. Double bedroom; double aspect double glazed windows facing the side, Cormar Sensations carpeted flooring , painted plaster ceiling, recessed lighting and feature light. Climate control and LED lighting with ample phone , Ethernet and mains points. Bespoke Walnut door from Spain with Karcher handles. An elegant room created with attention to detail .Climate control, Cormar Sensations carpeted flooring, fitted wardrobes, by Oakleigh Bespoke Cabinet Makers of Altrincham, painted plaster ceiling, LED feature lighting. A room created by Porcelanosa with a bespoke frosted glass entrance door, soft and slow close and opening mechanism made by Cheshire Glass. Featuring privacy glass screen this provides the ultimate in privacy. Luxury tiled flooring with under floor heating, painted plaster ceiling, and LED ceiling spotlights. Wall mounted sink, shaving point, 1300mm Royal Reflex cabinet / mirror. The freestanding bath was positioned to take advantage of the City's skyline with a view of The Beetham Tower. Incorporated with the bathroom with tiled flooring, painted plaster ceiling, spotlights. Power shower and wet room. Created by Porcelanosa. Porcelonosa tiled flooring, tiled walls, painted plaster ceiling, spotlights. Close coupled WC, wall-mounted sink, extractor fan. Double bedroom; double glazed window. Climate control, painted plaster ceiling feature LED lighting. Multiple phone, Ethernet and mains points. Steps lead up to custom made wardrobe providing excellent storage. Bespoke Walnut door from Spain with Karcher handles. A touch of luxury by Porcelanosa with a heated towel rail, tiled flooring, tiled walls, painted plaster ceiling, spotlights. Concealed cistern WC, walk-in shower, wall-mounted sink, extractor fan and shaving point. 800 mm Royal Reflex mirror cabinet with Bella Vista cosmetic mirror in Chrome. Under floor heating. Bespoke Walnut door from Spain with Karcher handles .UPVC sliding double glazed door, opening onto the private terrace. Double glazed window. Climate control, Cormar Sensationscarpeted flooring, painted plaster ceiling, spotlights Phone, Ethernet and mains points. Classed as the third bedroom but suitable as a great office / study. A balcony with blue outdoor multi coloured LED strip lighting, spot lighting with dimmer switch. Views towards Castlefireld , Salford Quays, Media City UK and Manchester United. A superb full with private terrace with out door LED lighting and feature flooring. Offering a superb out door space with unobstructed views of Salford , the city centre and far reaching views towards the countryside. With outdoor mains points.